News stories are flashing all around the globe accompanied by dramatic film footage of a blonde woman being taken by stretcher from Tiger Woods home. There is of course much speculation about the identity of the as yet unnamed woman, with many believing that this is Tiger’s wife Elin Nordegren. However more up to date news commentators are saying that the woman is described by witnesses as middle aged which would point to the woman being Tiger’s mother-in-law. It has been reported that both Elin’s mother and sister have been staying at the mansion since Thanksgiving and are believed to still be residing at the millionaire golf stars home. Further witnesses have stated that a blond woman was seen following the ambulance to the hospital in a black car similar to the car that Tiger Woods crashed on 27th November. There have been stories in the press that Elin has in fact left the Woods family home after the recent dramatic revelations of Tiger’s reported serial affairs. The total of those claiming to have had affairs with Tiger Woods is now up to ten if a report in todays Guardian is correct. Bingo Hideout have recently covered stories regarding the crash and the ensuing problems that the family have suffered, this latest episode will no doubt add to the media frenzy that now seems to follow Woods around like a bad smell. 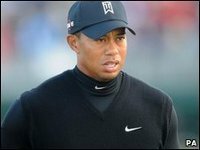 Recent reports have stated that Tiger Woods had been taken to hospital on the night of the famous car accident with a suspected drug overdose and not as a result of injuries sustained in the crash as previously thought, however these stories at the moment are purely speculative. Tiger Woods is believed to be acting as a close friend’s best man shortly, which is an ironic role for the golfer in light of recent news stories.